This project will focus upon the near real-time modelling and failure diagnosis of water distribution networks. The work is motivated by the increasing need for water companies to optimize performance by gaining understanding of the behavior of their complex large scale networks. Water supply systems include (i) ageing pipeline infrastructure, (ii) control assets such as pumps and valves whose performance might frequently deviate from design values; and, (iii) an increasing number of customers and associated water demand. These operational challenges are further complicated by regulatory changes and financial constraints. Consequently, water utilities are beginning to recognise the need for near real-time knowledge (monitoring and modelling) and efficient control of their networks. These capabilities are currently constrained by the lack of data with sufficient temporal and spatial resolution, and computationally efficient and robust near real-time hydraulic models which can utilise data with increased resolution in order to support advanced applications for leak and bursts diagnosis and incident management. The work in this project will aim to develop and validate computationally efficient and robust near real-time hydraulic solvers and control methods to enable reliable failure diagnosis, which includes the detection, localisation and identification of leaks and bursts. Leaks and bursts have a major impact not only in terms of resource losses and increased carbon footprint but also on the deterioration and cascading failure of neighbouring infrastructure. Urban roads are conduits for water, gas, electricity, communication and other infrastructure and water pipe bursts may cause major traffic disruptions and tunnels deterioration for Transport for London. The research will analyse and validate mathematical methods and factors affecting the accuracy and applicability of near-real time hydraulic models to support the implementation of failure diagnosis. The work will include the use of model-based optimization and estimation tools for fault diagnosis. The impact of different modelling techniques and the impact of their accuracy on uncertainties will be analyzed. The candidate will study and further develop tailored optimization tools necessary for the estimation problems arising here so that near real-time decision making capabilities can be created. 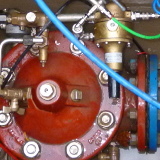 The design and execution of an experimental programme in collaboration with Bristol Water will allow validation of developed tools to quantify the effect of uncertainties in demand data, sensor measurements, and the level of leakage on the accuracy of the different approaches to estimate the location level of leakage. The successful candidate will join a multidisciplinary team of researchers at InfraSense Labs led by Dr Ivan Stoianov (Department of Civil and Environmental Engineering). The immediate research group is currently composed of 2 post-doctoral research associates and 9 PhD students working on various aspects of smart water systems modelling, optimization and control. The successful candidate will develop their understanding of water distribution networks and appropriate numerical tools for large scale water distribution systems. There will also be an opportunity to develop relevant algorithms in Matlab, and other software. You will learn from the technical expertise of our dynamic, multidisciplinary team of researchers and collaborators. Funding is available for applicants with settled UK status (see here for eligibility). The studentship offers a stipend of approximately £17,000 per annum (tax free) and covers fees at the UK/EU student rate for a period of four years. Matlab, and possibly Python, C++, etc. For informal enquires and to request more information, contact Dr Ivan Stoianov. This PhD studentship is co-funded by the EPSRC CDT in Sustainable Civil Engineeting at Imperial College London. Review of application is now in progress and will continue until suitable candidate is identified. The starting date for this PhD Studentship is the 1st of October, 2016. This project investigates the design and operation of intelligent water supply networks with dynamically configurable topologies. It is motivated by the increasing need for water companies to reduce leakage levels by actively managing pressure whilst at the same time providing higher quality of service to customers (e.g. a reduction in supply interruptions). The benefits of optimally controlling the water supply systems pressure has already been demonstrated using a novel methodology and algorithms for the dynamic aggregation of water supply zones using self-powered control valves. The work has been pioneered by the InfraSense Labs (www.infrasense.net) and demonstrated on an operational water distribution network in the UK serving 8,000 properties. This applied research on dynamic network topologies has also demonstrated the increase in resilience that comes from optimally aggregating pressure zones. The current project will build upon existing research; one of the project aims is to study various indices of resilience that can measure the system's ability to maintain sufficient levels of service under disruptive events. The integral design and operation of dynamic topologies will be studied by explicitly incorporating objectives to maximise resilience of urban water networks. Simulating tools and optimization algorithms for computing resilience indices for water distribution networks will be studied. Optimization and graph-theory tools will be used to investigate what kind of topologies benefit from dynamic optimal pressure management. This will be done in collaboration with a UK water utility. The successful candidate will develop their understanding of water distribution networks and appropriate numerical tools for large scale water distribution systems. There will also be an opportunity to develop relevant algorithms in Matlab, and other software. You will learn from the technical expertise of our dynamic, multidisciplinary team of researchers and collaborators. You will also develop a number of mathematical optimization and optimal control problems to solve various objectives ranging from network pressure management to improved network resilience. New insights will also be developed by investigating various, possibly conflicting, control objectives and the trade-offs that have to be made. The student will take part in an extensive field-based experimental programme. Applicants for the studentship should have or expect to obtain a first or upper second class honours degree or equivalent, in a relevant aspect of Engineering (Mechanical Engineering, Civil Engineering) or other strongly quantitative engineering discipline. An MSc in these subjects would also be desirable. Good computing skills are also required. Numerical Methods for Solving Linear and nonlinear Equations, Optimization, Network systems.